With eVTOL urban mobility yet to arrive, some makers of traditional helicopters are trying to carve out a role in the space. While electric vertical takeoff and landing (eVTOL) vehicles may present affordable, fast and safe options for commuters and other travelers down the line, some makers of traditional helicopters are trying to carve out a role for them in urban air mobility. Executives at helicopter firms note the challenges eVTOL vehicles will likely face in getting FAA certification and said traditional helicopters present an existing solution, though not at the scale envisioned by Uber and other major players in the urban air mobility arena. Kurt Robinson, the CEO of Robinson helicopters, said that his company’s R44 and R66 turbine models — equipped with autopilot, GPS and stability augmentation systems — could readily serve the urban mobility market, particularly the R66 with its five seats and 300-pound baggage compartment. Lockheed Martin’s Sikorsky is also looking to get into the urban air mobility market. 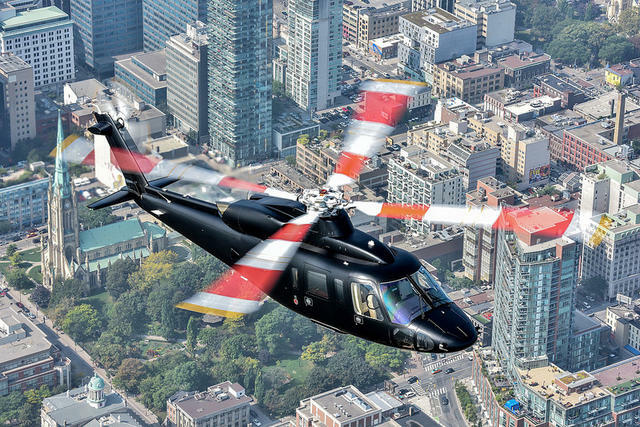 Sikorsky’s Associated Aircraft Group (AAG) and Fly Blade, or BLADE — a helicopter and fixed-wing ride sharing service — are teaming up to provide a new on-demand urban mobility option in the New York City metropolitan area. Sikorsky pilots and technicians are flying and maintaining a S-76C+ helicopter for BLADE, and BLADE will have access to AAG’s full fleet of Sikorsky helicopters, the largest in the Northeast, as needed, according to Lockheed Martin. BLADE’s flights are available through the company’s proprietary mobile app from Manhattan to airports in Boston, Washington, D.C., and other business and leisure destinations in the Northeast. The AAG/BLADE agreement establishes a working group to explore how AAG can best leverage BLADE’s consumer, cockpit and operator technology platform. “Vertical lift becomes increasingly important as cities grow, and this relationship allows us to gain critical insights to emerging needs in that space,” she said. Will Heyburn, the head of corporate development and business processes at BLADE, said that the company believes that large-scale urban air mobility will come about through an evolutionary process, given regulatory hurdles and safety and public perception issues. “We believe you have to build trust incrementally over time,” Heyburn said. Blade also has operations in Los Angeles and Miami, with plans to launch service this year in India. Helicopter flights from Mumbai to Pune will take about 40 minutes, Heyburn said, as opposed to the three to eight hours such a journey can take by car.